In 2003, 30 years after they served together in the Vietnam War, former Navy Corps medic Larry “Doc” Shepherd (Steve Carell) finds former Marines Sal Nealon (Bryan Cranston) and Reverend Richard Mueller (Laurence Fishburne) on a different type of mission: to bury Doc’s son, a young Marine killed in the Iraq War. Doc decides to forgo a military burial and, with the help of his old buddies, takes the casket on a trip up the East Coast to his suburban home town. Along the way, Doc, Sal and Mueller rekindle old friendships as they come to terms with the wars that continue to shape their lives. In 1973 inspired by the novel by Darryl Ponicsan, director Hal Ashby made a film called The Last Detail, starring Jack Nicholson, Randy Quaid and Otis Young. Last Flag Flying is a sequel of sorts. Richard Linklater’s movie is based on Ponicsan’s follow-up book and, as a result, shares common themes with Ashby's film. Last Flag Flying also shares the tone, pacing and atmosphere of many of Linklater’s own past films. This is, of course, the director of Boyhood and The Before Trilogy. A filmmaker who favours characters over plot and who reveals powerful insights into the human condition via a series of seemingly random (and often rambling) conversations. While Last Flag Flying isn’t my favourite Richard Linklater movie, it is nonetheless a powerful and deeply moving film that explores grief and guilt, truth and lies and love and friendship. The film also looks at the impact of war and what it means to fight for your country. Last Flag Flying's themes are beautifully conveyed thanks to the film’s stellar cast. Laurence Fishburne, Bryan Cranston and Steve Carell display wonderful energy and on screen chemistry - largely thanks to Linklater’s legendary collaborative approach. I enjoyed their interactions and believed in their friendship. I also loved J. Quinton Johnson’s performance as Washington. A phenomenal screen presence, Fishburne is superb as Reverend Richard Mueller. When his two Marine Corp buddies turn up at his church, he is confronted by the darkness in his past - darkness that he has desperately tried to leave behind. Meanwhile, Bryan Cranston shines as Sal Nealon. This is the film’s loudest, showiest role and Cranston plays it to perfection. He gets the best (often acerbic) lines and definitely has the most fun - as do we while watching him. However, it is Steve Carell’s performance - a moving study of grief - that feels the most impressive. Playing against type (and showing just what a versatile actor he really is) Carell’s performance as Larry 'Doc' Shepherd is heartbreakingly understated - moving me to tears on more than one occasion. 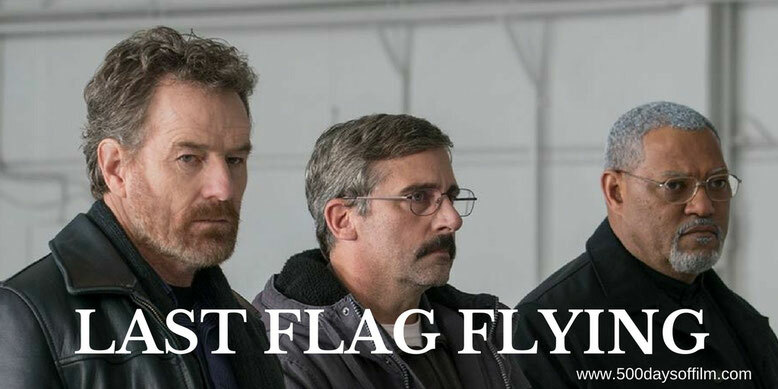 Have you watched Last Flag Flying? If you have, what did you think about Richard Linklater’s film? Let me know in the comments section below or via Facebook or Twitter (@500DaysOfFilm).